Little Miss has half an Udi's (Gluten, Nut, Soy, & Dairy Free) Bagel with SunButter and Honey. 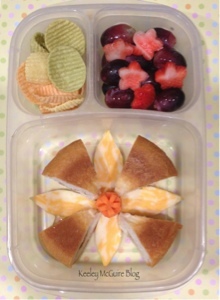 I cut it into four bites then created a flower shape using colby jack cheese slices and a carrot for the center. Top right is a grape and strawberry mix. The strawberries are cut into flower shapes also.